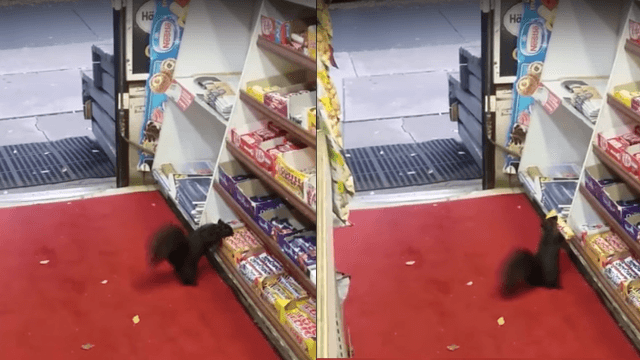 Thieving squirrels terrorize Canadian convenience store. A gang of shoplifting squirrels have been stealing candy bars from a convenience store in Canada. And it seems they're pretty skilled criminals. According to The Toronto Star, a gang of conniving squirrel thieves keep stealing candy bars from Luke's Grocery in Toronto. One of the furry little shoplifters was caught red-handed on video, stealing a candy bar and making a break for it. "I always see them sneaking outside the door, looking in my store, and even right at me!" the shop's owner, Paul Kim, told The Star. Kim says by his estimates, the squirrels have snagged around "48-ish" candy bars to date. So they know who the culprits are, but haven't been able to catch them? Those squirrels are master criminals.